The trees are alive with the sounds of cicadas, summer songs that prove that sweet notes don't necessarily have to be pure notes. These big-bodied bugs live high in the trees, seemingly celebrating the years -- from two to 20 of them -- they were burrowed underground. There, the nymphs had sucked root juices and hibernated until, one evening, they emerged as large brownish-black bugs and flew to the nearest treetop. 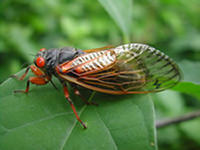 As the sun rises and the day warms, the male cicadas' odd songs grow stronger. No sound better symbolizes a hot summer day than the crescendos of their overhead buzzing. Each of some 75 species found in the East has its own time of day for singing and its own particular note -- in some well-cicadaed parts of the tropical world, people tell the time of day from the different species' songs. Unlike crickets, which make their sounds by rubbing their legs against their bodies, the cicada sings with a membrane, vibrated by muscles, on its thorax. The arrangement is not unlike a drum without drumsticks. In fact, the cicada's sizable body is largely hollow, acting as a sounding box that helps throw the song hundreds of feet through the trees. The males join in a chorus to increase the volume. The aim, of course, is to attract females. One might say the cicadas are drumming up a summer love. It is their last fling, for soon they'll die. But they'll leave behind eggs of cicadas that will sing to us again, two, five, 13, maybe even 17 or 20 years from now.